I have never been the sort of person that is easily influenced by movies, after all nobody falls in love happily ever after or gets the chance to go on a magic carpet ride. 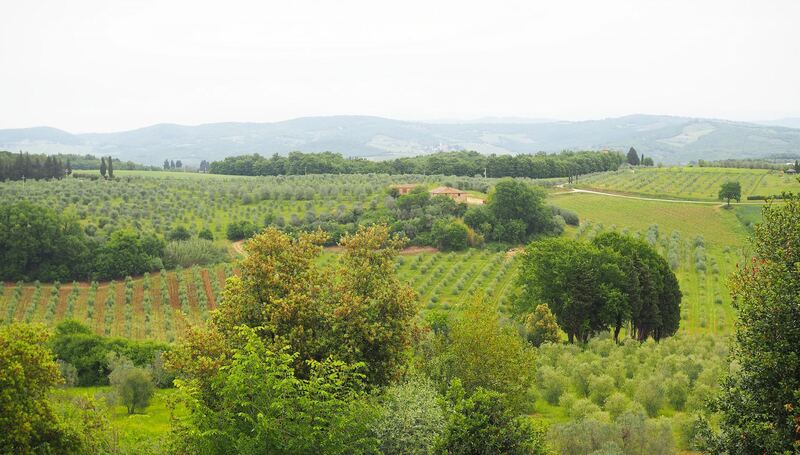 However, when I watched ‘Under The Tuscan Sun’ a film that isn’t often talked about, it really resonated with me. 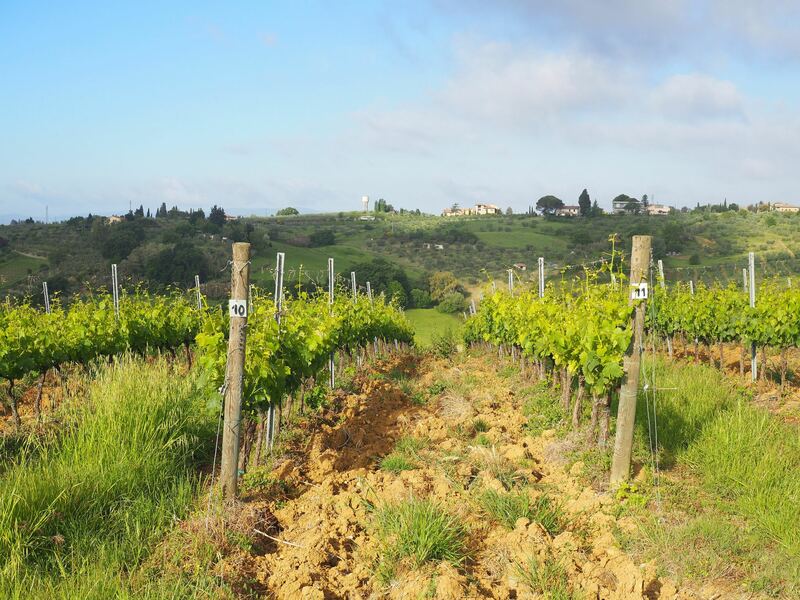 Sitting in bed, I started to have an enriching growth of wanderlust for the Italian country side, decorated with many wine grape vineyards. 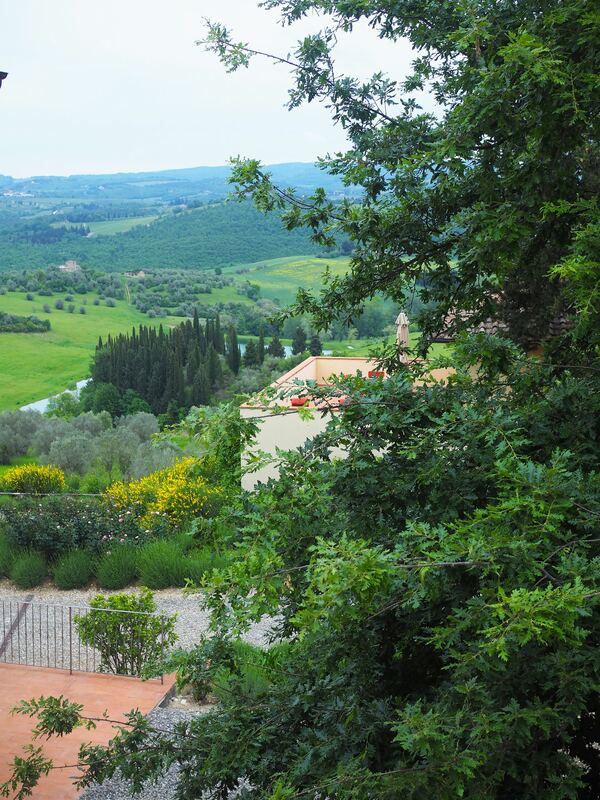 It was then that Tuscany became one of top destinations on my wanderlust bucket list. Before I knew it, I found myself on a plane jetting out to a place I had only dreamt of visiting. 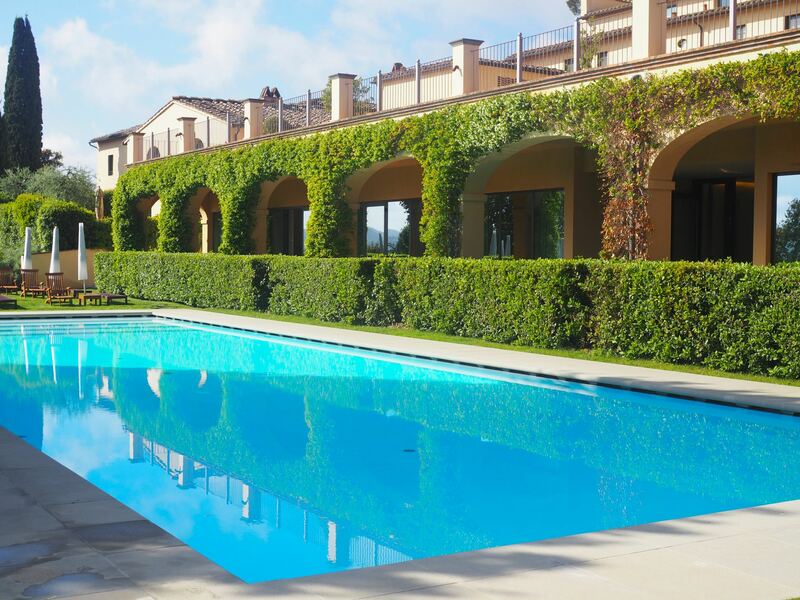 Not forgetting a 5-star luxury hotel I have had my eye on for a very long time, Castello Del Nero. Arriving into Pisa airport, I could feel every inch of my body shaking with pure glee. Descending over what looked like barren greenery from such height. I was finally making my Tuscan dream a living reality. 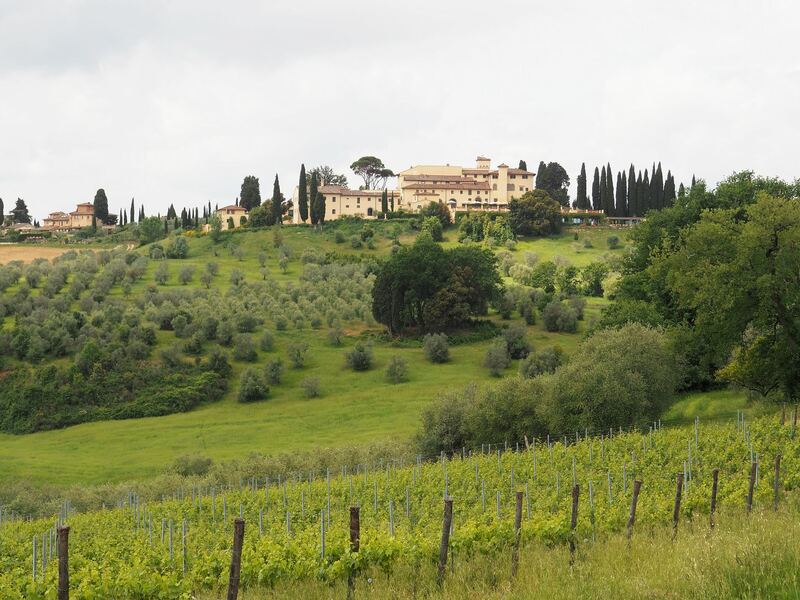 Castello Del Nero is based 60 minutes from Pisa airport, but that didn’t put me off as there were miles of scenic Italian countryside to accompany me on my travels. 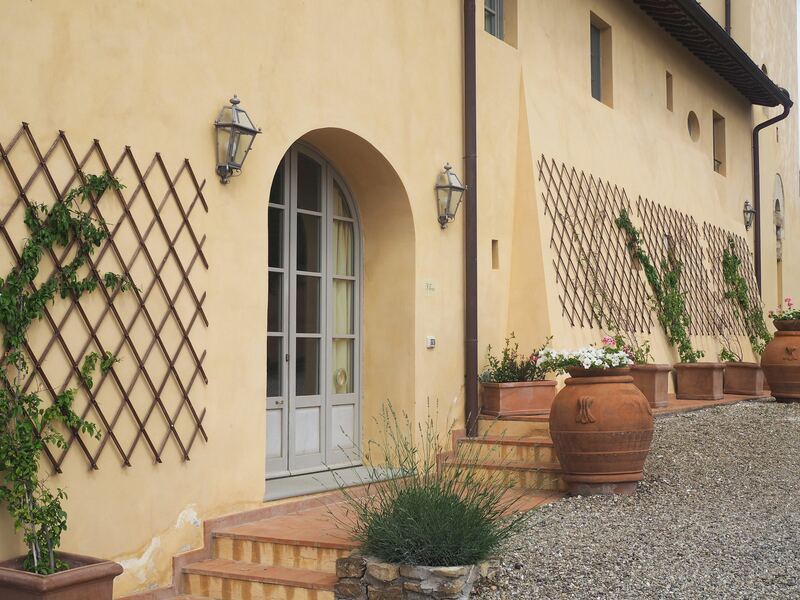 Pulling up to two large gothic style black gates, I knew we were arriving at the palatial Tuscan castle in the Chianti wine region. It had only been turned into residence in the past 11 years, so other areas of the estate were still in development. 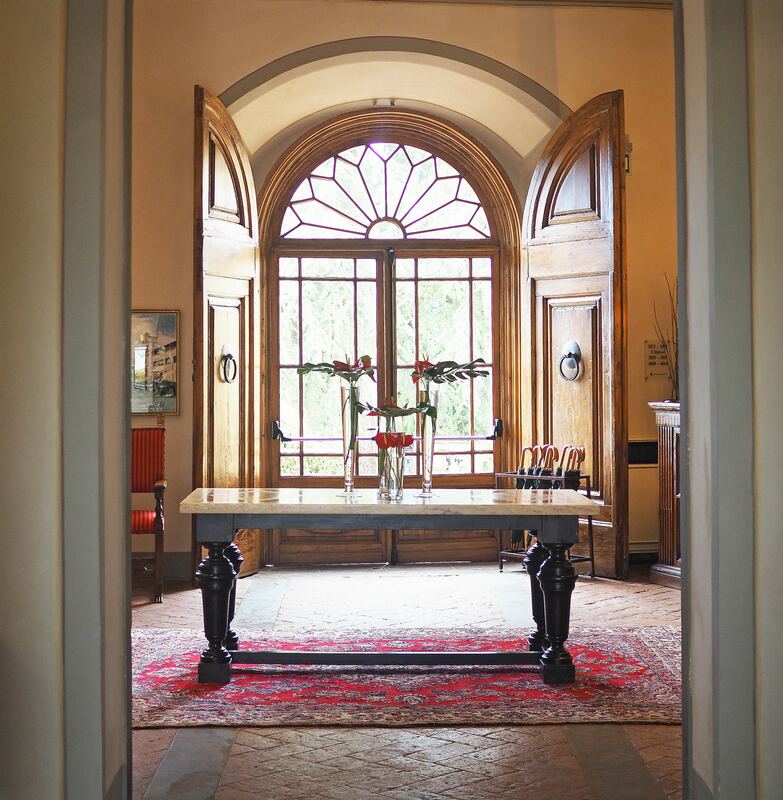 The jewel itself was in its entirety that boasted an authentic Tuscan feel. 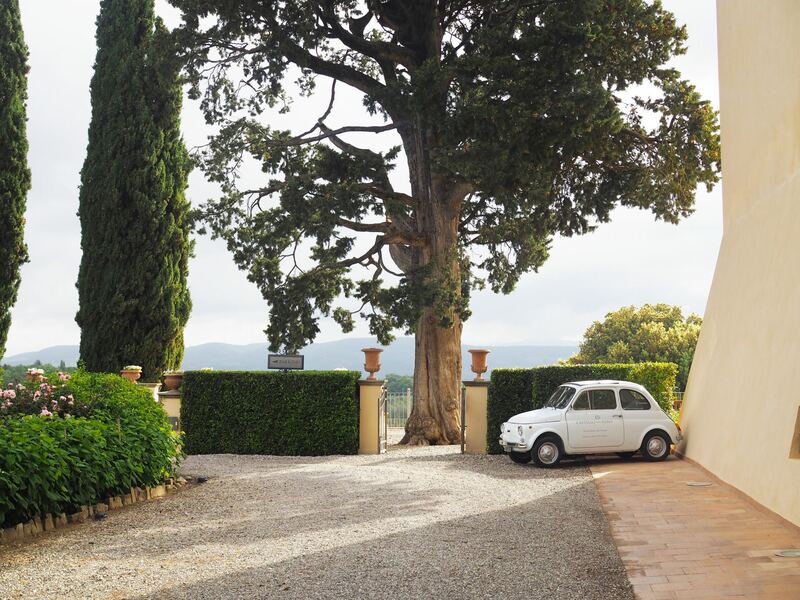 From the manicured trees and shrubs, to the cobbled flooring, the low hanging chandeliers and the historic frescos, we were living the true luxury Italian lifestyle. 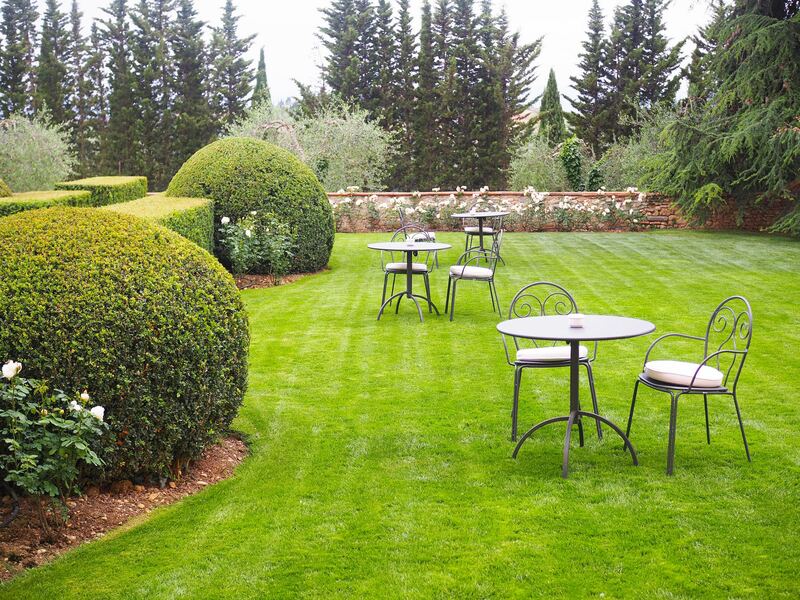 The hotel itself is made up of 50 rooms, many of which have a gorgeous view of the estate grounds. 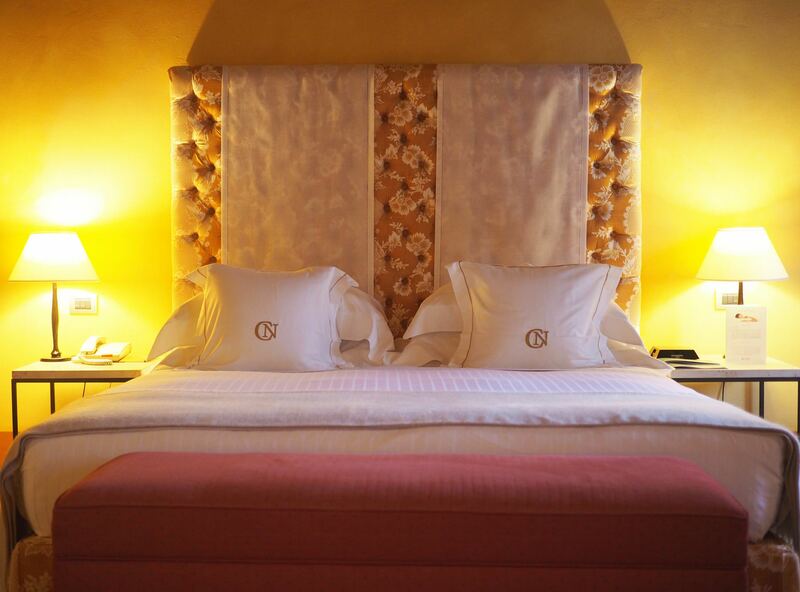 Each of the rooms have a unique colour scheme and just radiated opulence. From the entry rooms up to the suites, there was some character hidden in each room. I stayed in a deluxe double room that was huge. 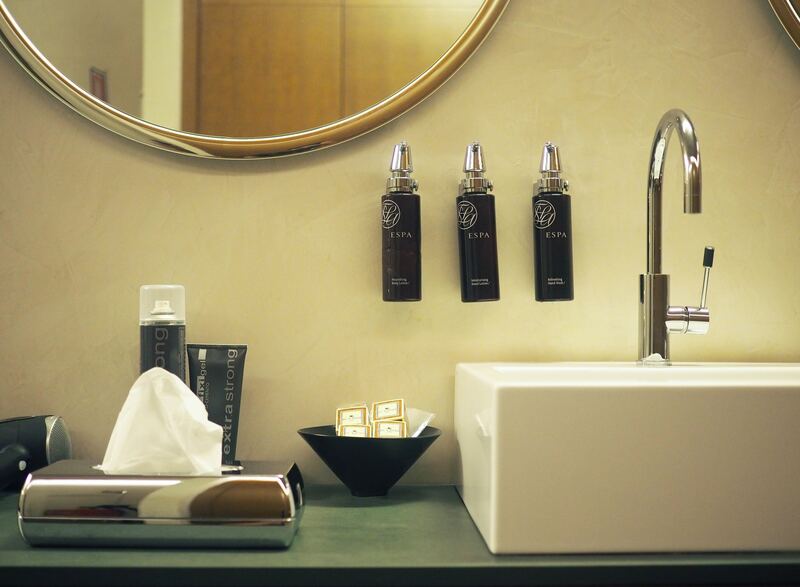 It reminded me very much of my stay at Four Season Lisbon, as the rooms were just as big. My bedroom had a pink theme that ran throughout the room, where each of the rooms had their own theme colour. 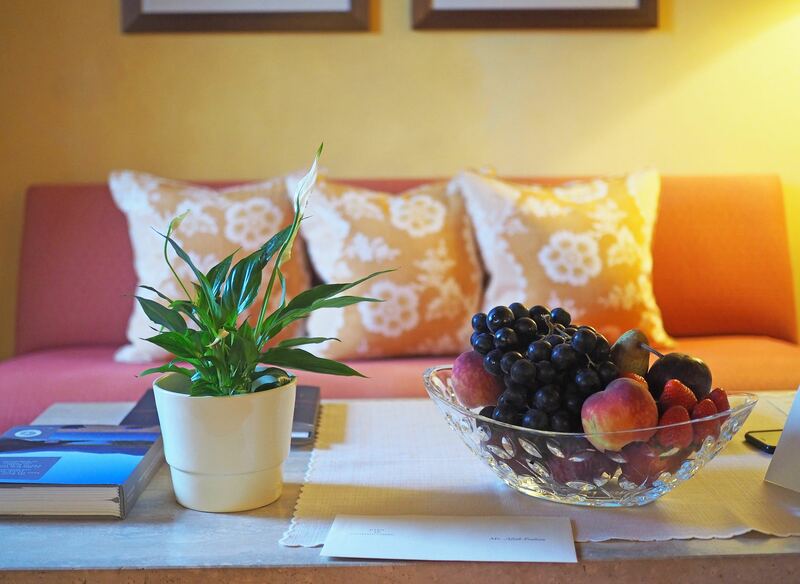 I was presented with a welcome letter, a fresh bowl of ripe fruit, bottles of water and some goodies of wine and olive oil produced by the hotel. 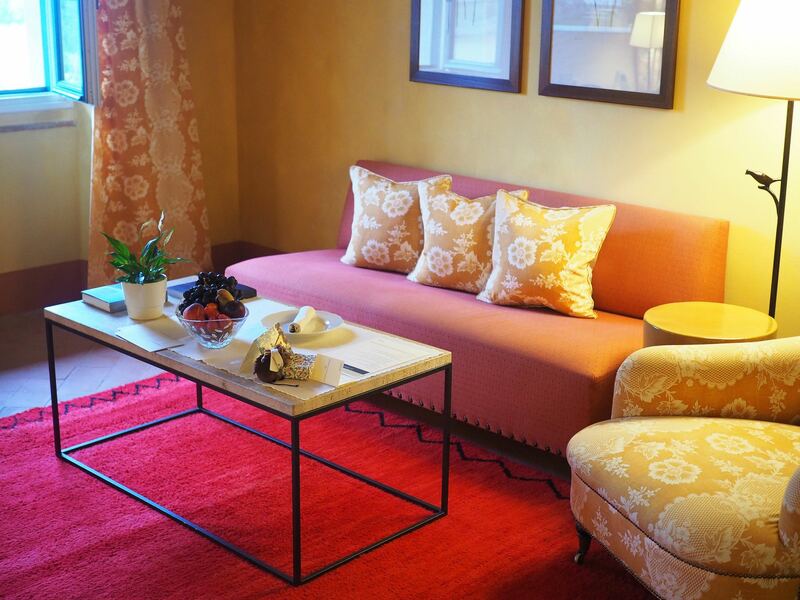 As I swung open the windows shutters, I was greeted by a warm sunny welcome, lighting up the room with a golden glow. 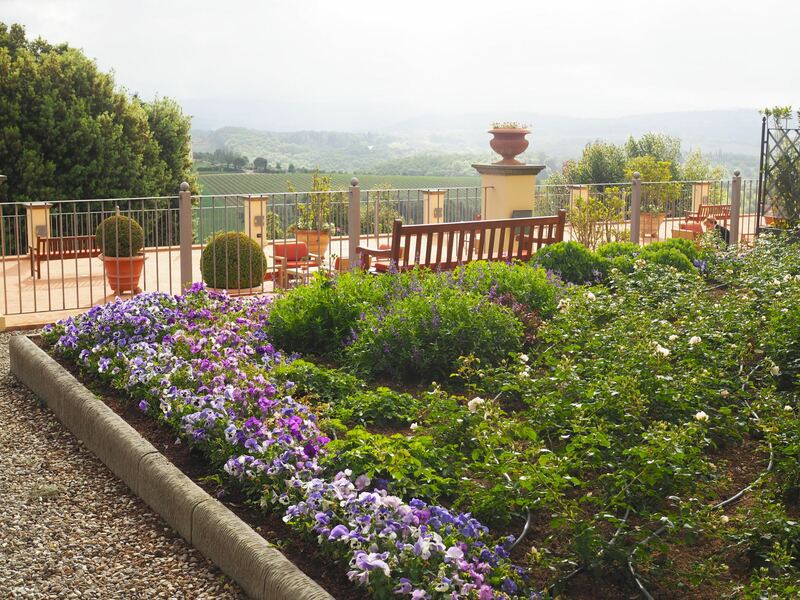 I ran around the room in complete awe, that I was in a true Italian style hotel, with views of grape vineyards and so much greenery from my bedroom window. 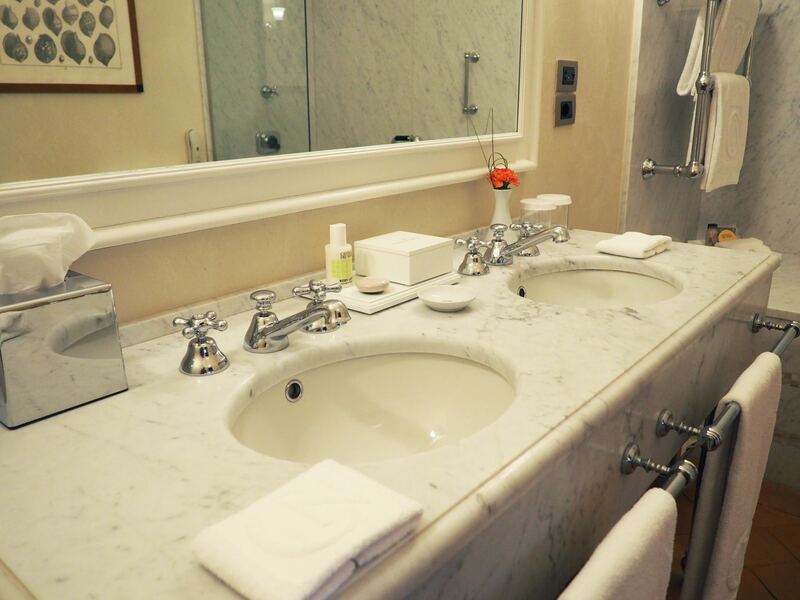 I had to quickly check out the bathroom, which was marble heaven. The double sink counter to the sunken in bath, it was all head to toe in marble. 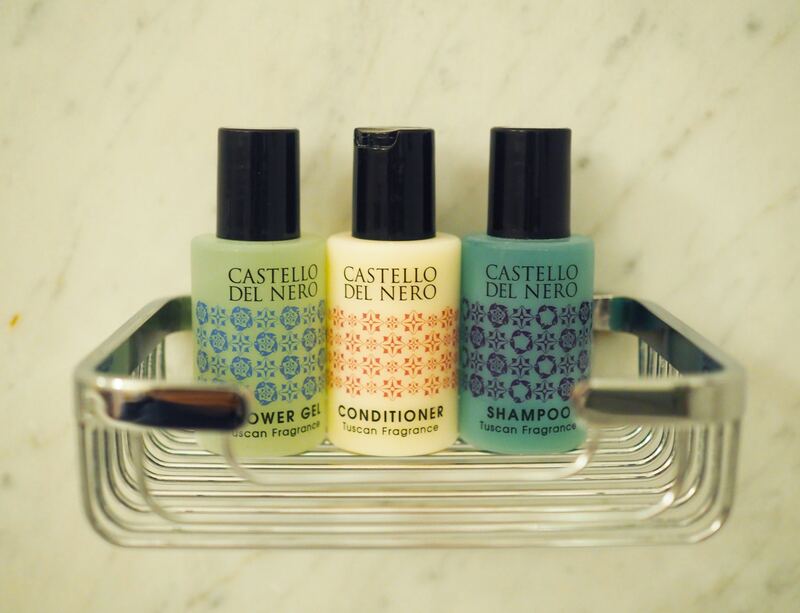 Complete with its very own Castello del Nero amenities with a Tuscan fragrance. Except I just couldn’t get enough of the view, so I had to run back for one last look out of my window. The air so fresh and the sun so strong, I left my windows open whilst I got ready and pottered off for our wine tasting experience. 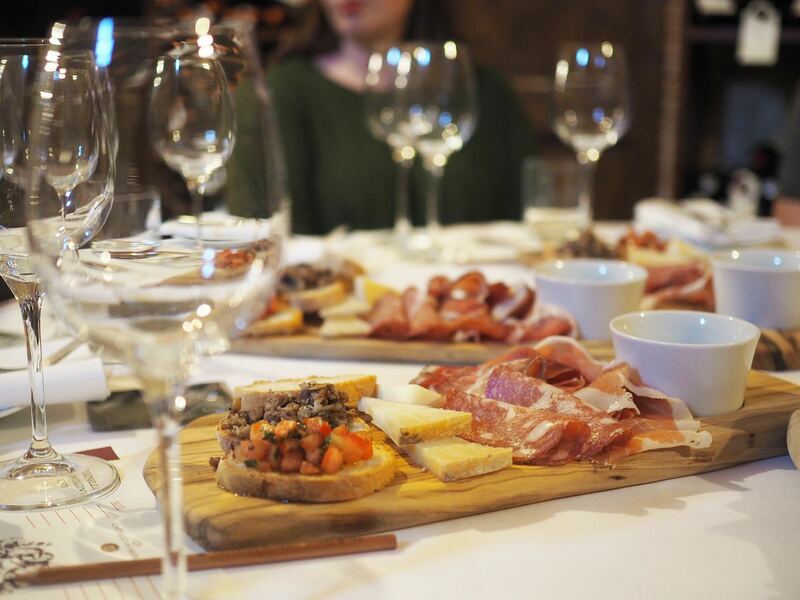 Down in the wine cellar was our set up for our wine tasting experience, complete with board of charcuterie, cheeses and breads. 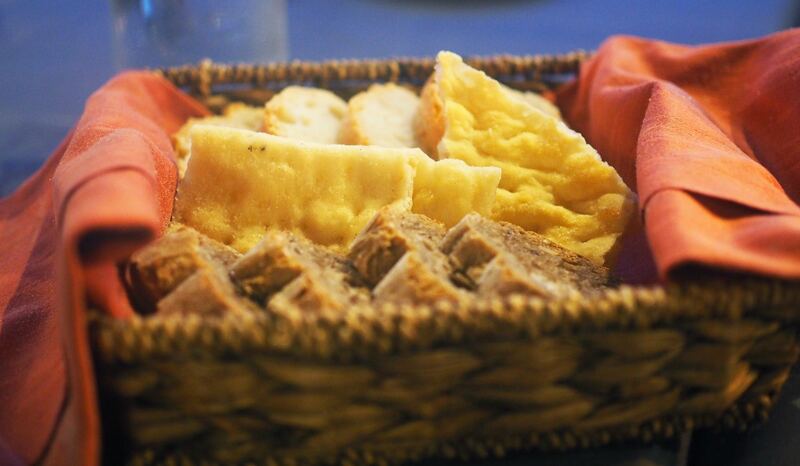 The lovely staff at Castello del Nero put together just one with cheese, bruschetta and an assortment of breads for me, as I cannot eat pork. 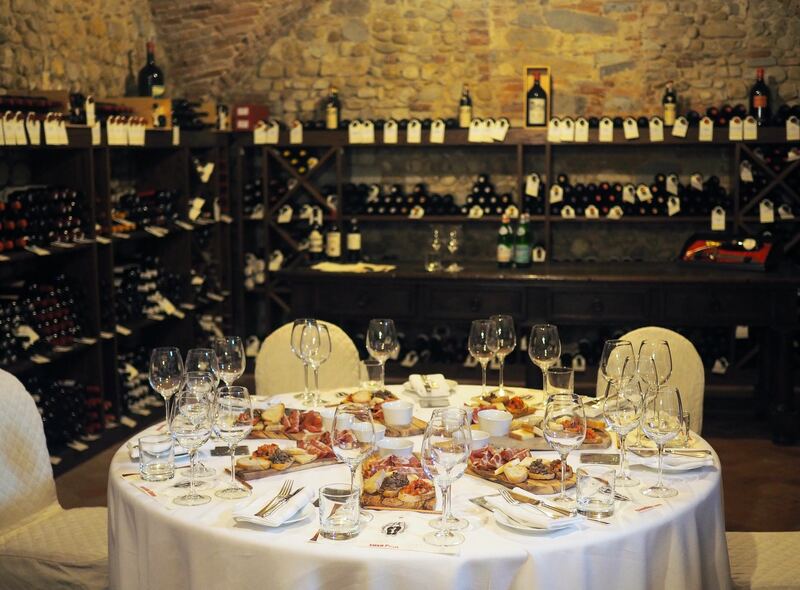 We were introduced to the head sommelier at Castello del Nero, who was also going to take us through our Italian wine tasting experience. 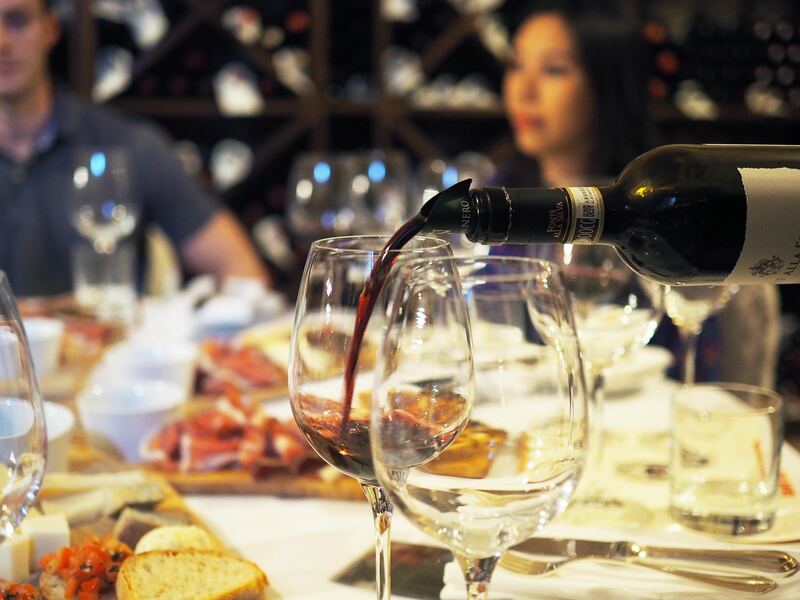 The wine tasting is available to all guests to experience at an additional cost or if booked in a package. 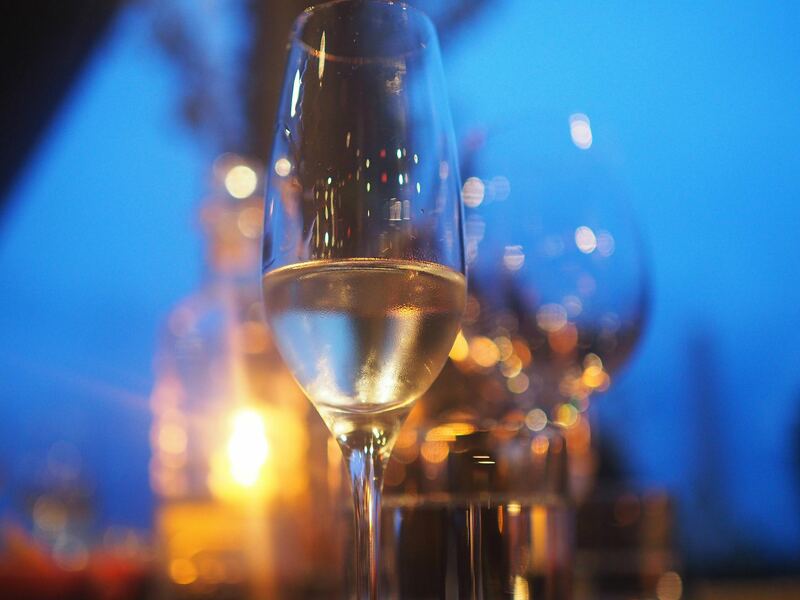 After our delicious wine tasting, we went down to the poolside to have a lovely alfresco dinner at La Taverna. 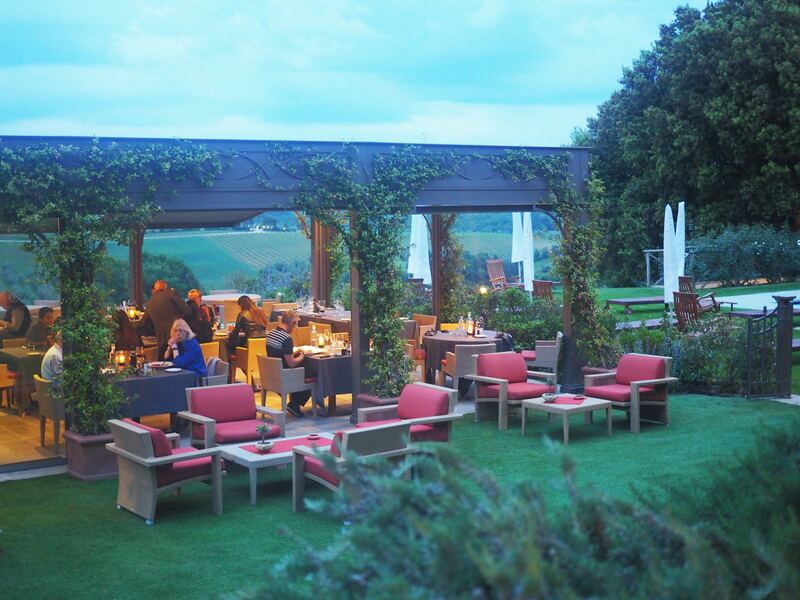 This is one of the two restaurants at Castello del Nero, the other being Michelin starred La Torre, which is featured here. 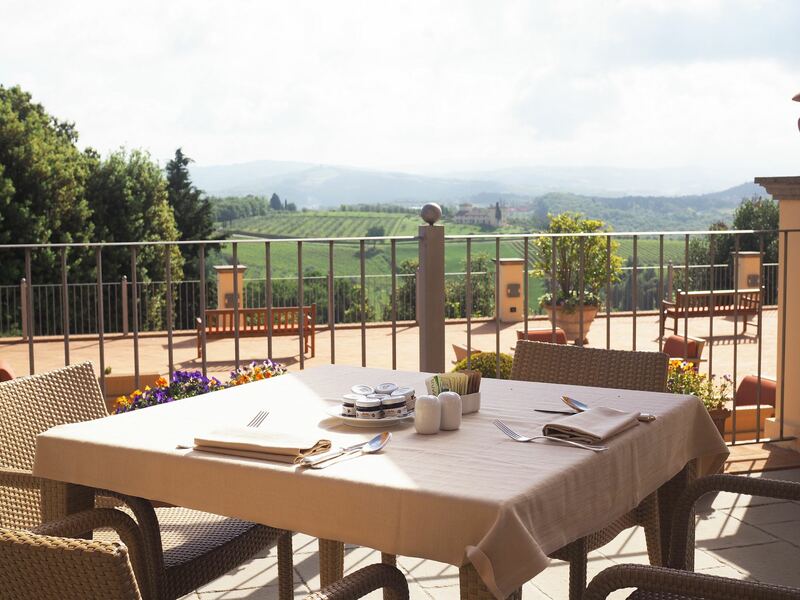 La Taverna is normally situated inside the hotel, but when the weather gets warmer in Italy, they move it outside for a more enjoyable Tuscan experience. It was certainly the perfect climate for it too, with what looked like a rather romantic setting too. 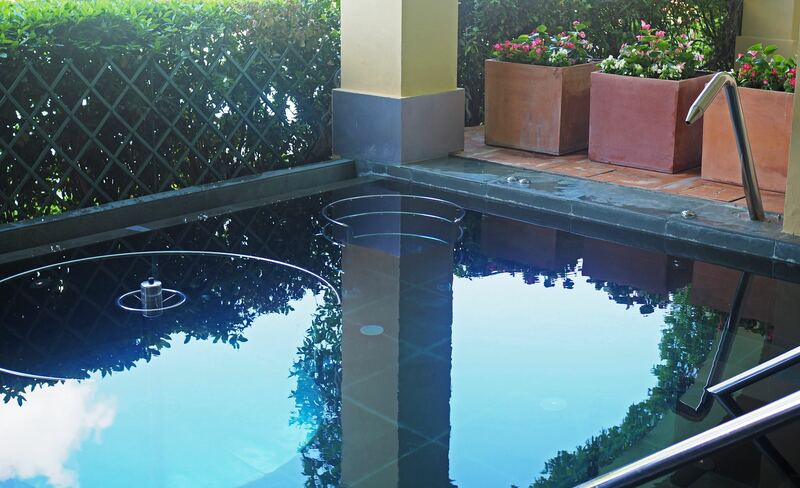 We were all seated around a long table that overlooked the pool, before being greeted by our waiters with a bread basket and fresh olive oil to start, along with a glass of ice-cold sparkling wine. 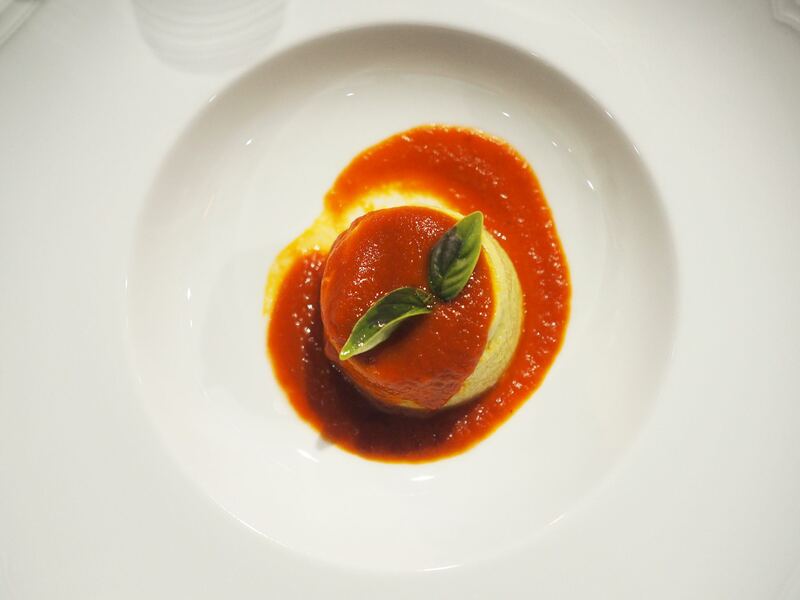 Before we knew it, we were brought out a starter of Zucchini flan with tomato volute and basil. 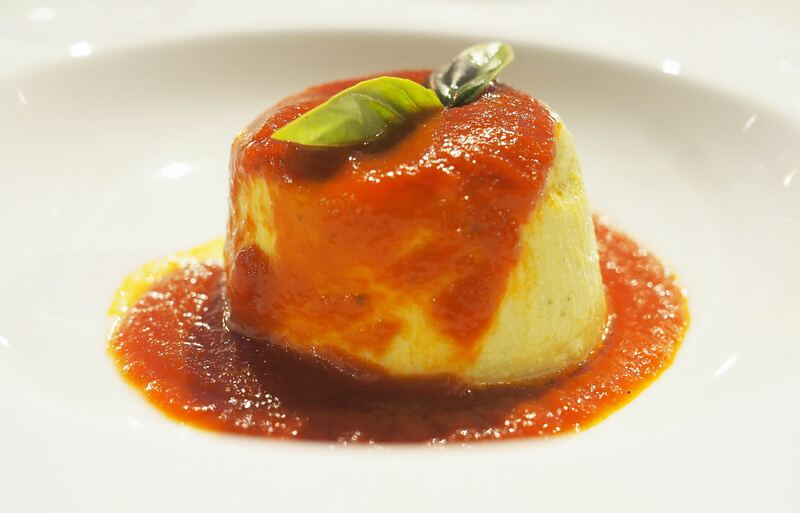 The flan itself had a mousse like lightness, it was so easy to eat and full of flavour. The tomato volute completed it so well and made for an excellent way to start our meal. 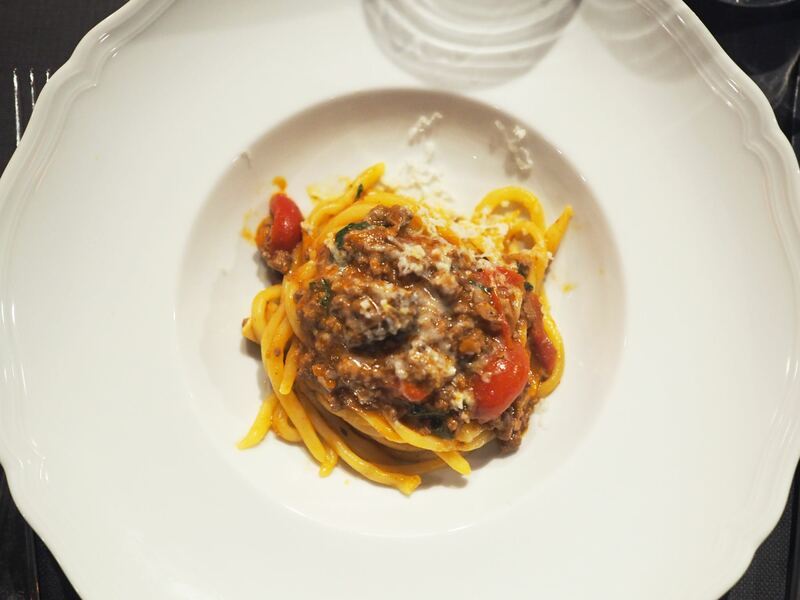 The second dish that came out was one of my favourites of the night, Pici pasta and Valdarno duck ragout with cherry tomatoes, cardoncelli mushroom and pecorino cheese. The dish itself had so much flavour and duck ragout was a first for me too. 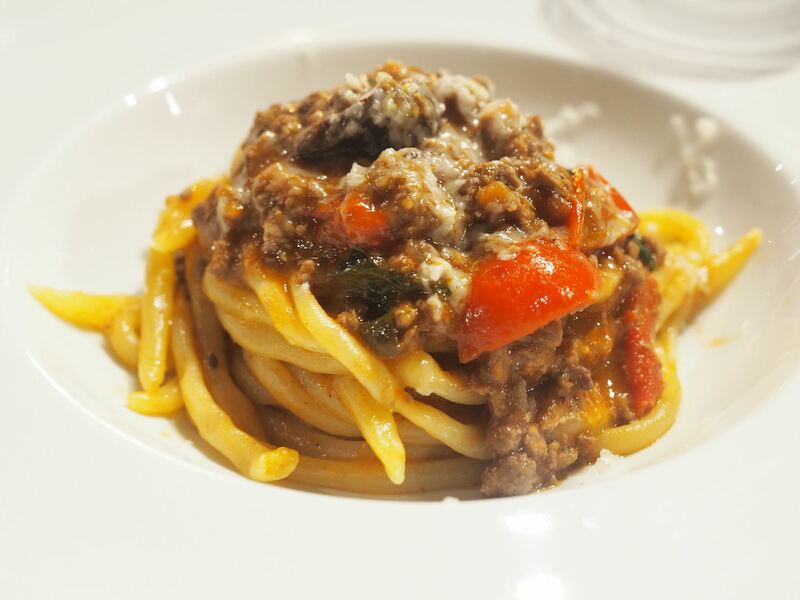 It tasted very similar to beef ragout, so it was a great alternative for someone who doesn’t eat much red meat. The next main dish was the sort you crave in the humid heat and it just went down a treat. 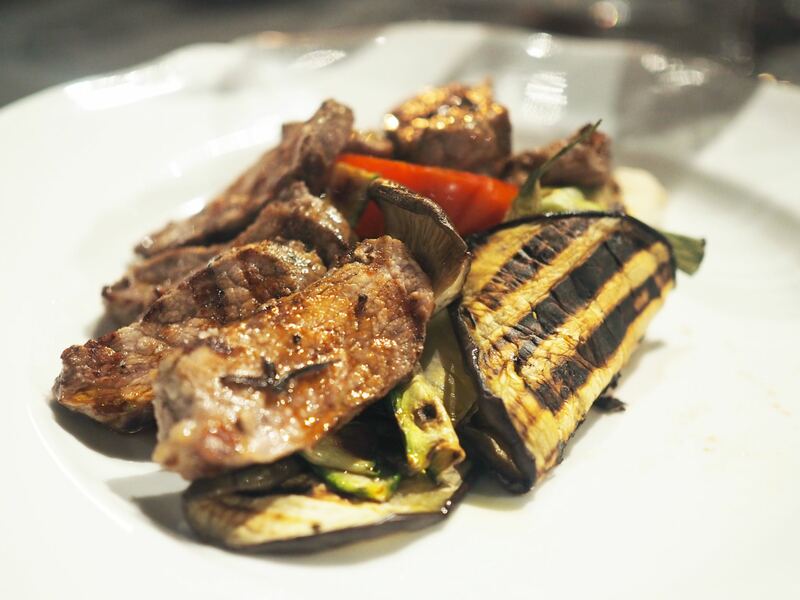 The grilled sliced Tuscan steak and grilled vegetables were just the cherry on top of what was a fantastic meal. The steak had clearly been seasoned to perfection and the smokey, exotic flavourings from the Mediterranean vegetables was so perfect. 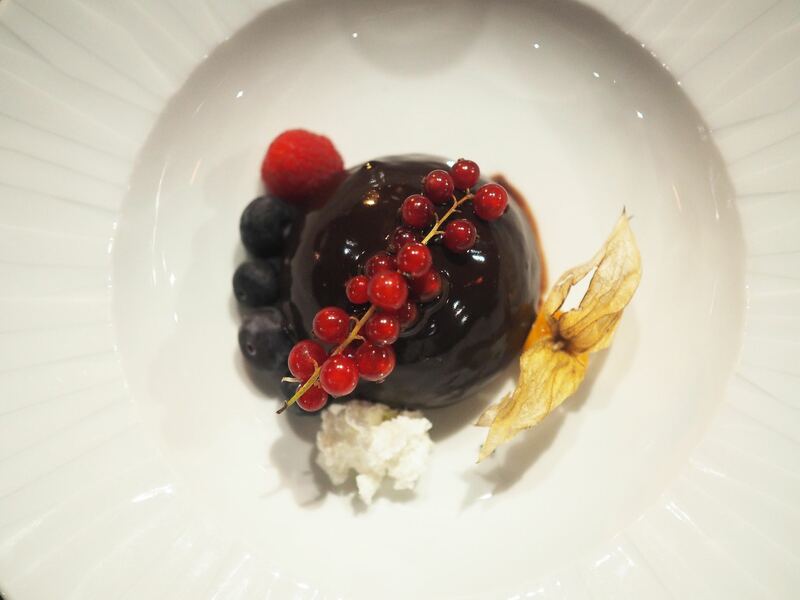 If all the divine food of the evening and the Castello del Nero home produced wine pairings of each dish wasn’t enough, we had to finish things on a sweet note. Zuccotto Fiorentina with cottage cheese and chocolate was our final dish of the evening. The following morning, a few of us woke up still feeling rather full still and a blessing that I wasn’t the only early bird on the trip. 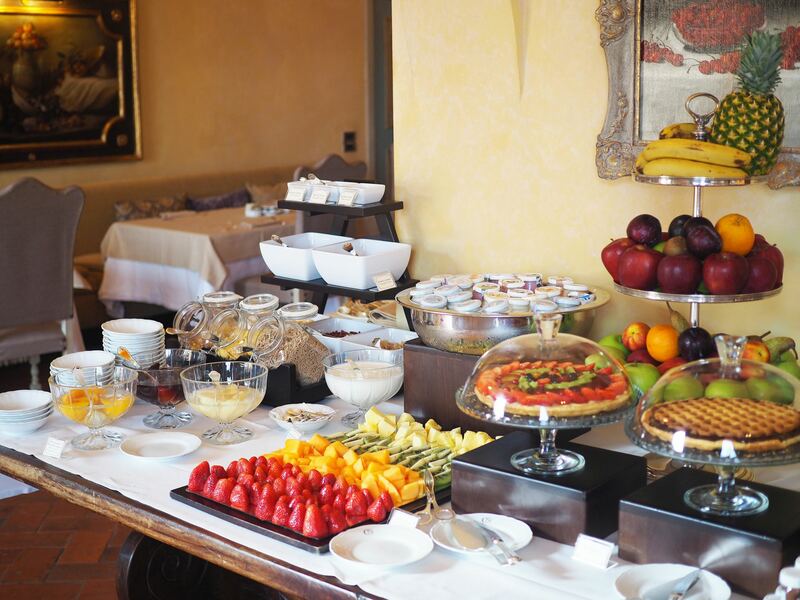 We all gathered just before 8am and set out for a morning walk along the Tuscan streets around the hotel. It being a Saturday morning, it was rather quiet, even for Tuscany. Such a pretty way to spend a morning, right? 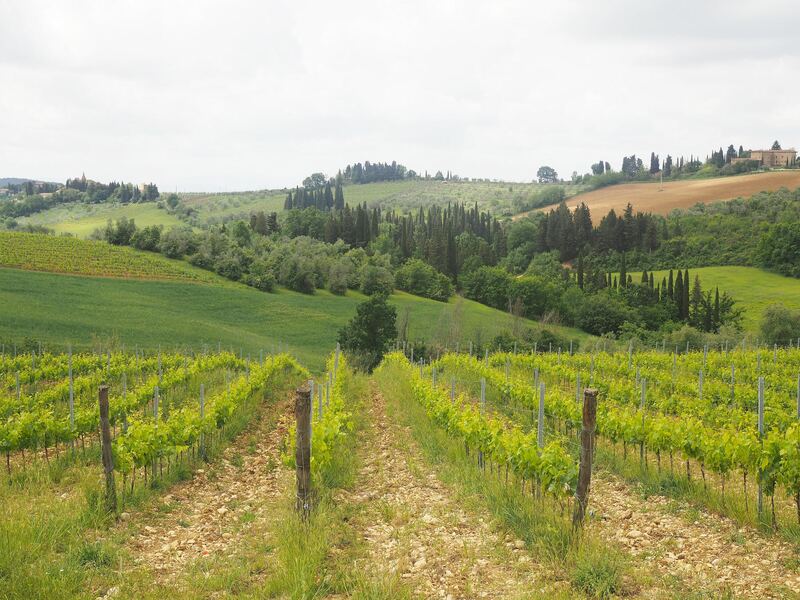 I could easily see myself retiring in the Chianti wine region with my own vineyard. After what was the most serene walk, we popped back to the hotel to freshen up before going down for a well deserved breakfast. 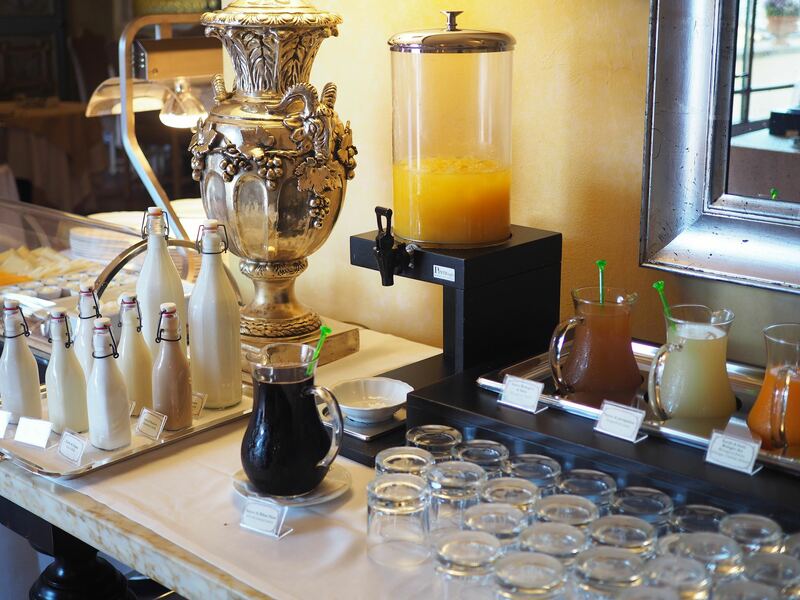 The breakfast is served in La Torre, the Michelin starred restaurant where we had dinner to come in the evening. The breakfast spread was just incredible. 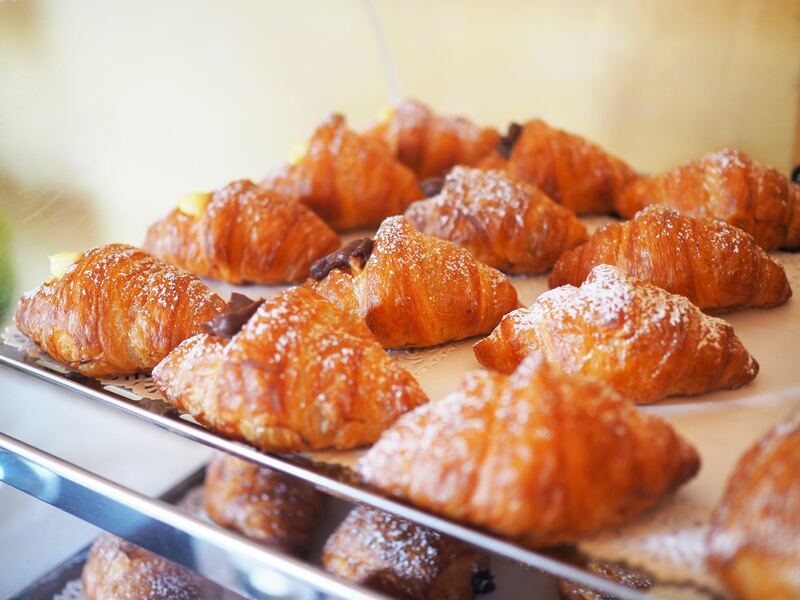 From a huge selection of cereals, fresh fruits to vanilla and chocolate cream filled croissants. There was even charcuterie, cheeses, warm breads, even pizza on offer too. What I loved the most was that they even had a selection of 8 different milks for those with intolerances and particular preferences. There was oat, coconut, soy, almond, cashew, goat and various other milks. You could even help yourself to fresh honey, along with the comb too. 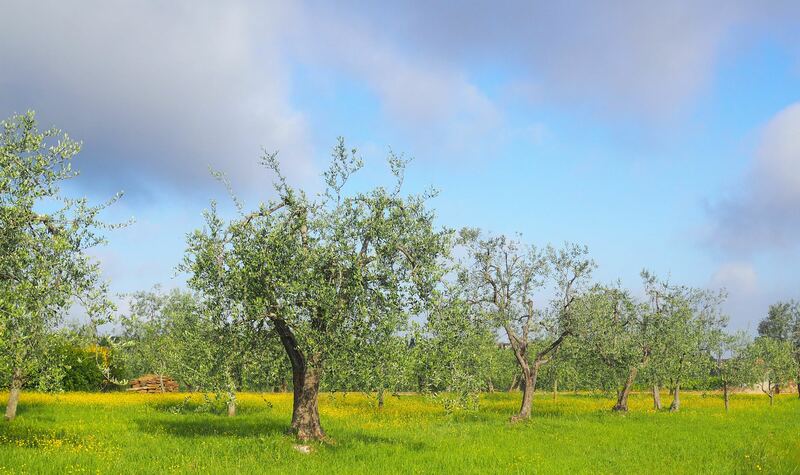 Castello del Nero have started farming their own bees now in hope to produce their own honey for the hotel and restaurants. Is there anything they can’t do?! 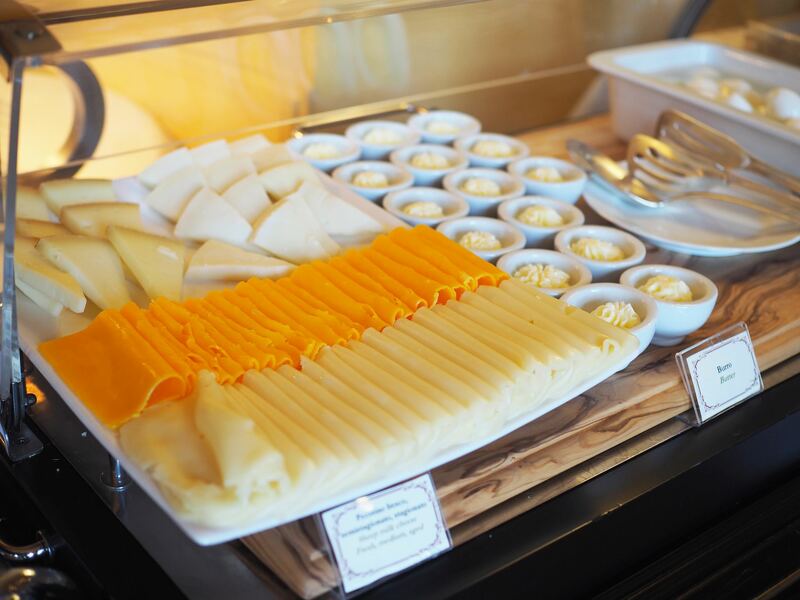 On top of the buffet breakfast selection, they also had a menu where they make to order. If you fancy pancakes, eggs Benedict/florentine or anything like that, there is that choice too. We dined out on the terrace to enjoy the hot morning sun with umbrellas to shade those that weren’t keen on getting a tan. It was the most magical breakfast I have ever had, especially with the views to match. Pure bliss! We all then set ourselves up for a morning visiting a nearby town, San Gimignano to master the art of gelato from one of the famous artesian gelatician’s. I hare more about the fun and knowledge we scooped up in a separate post. 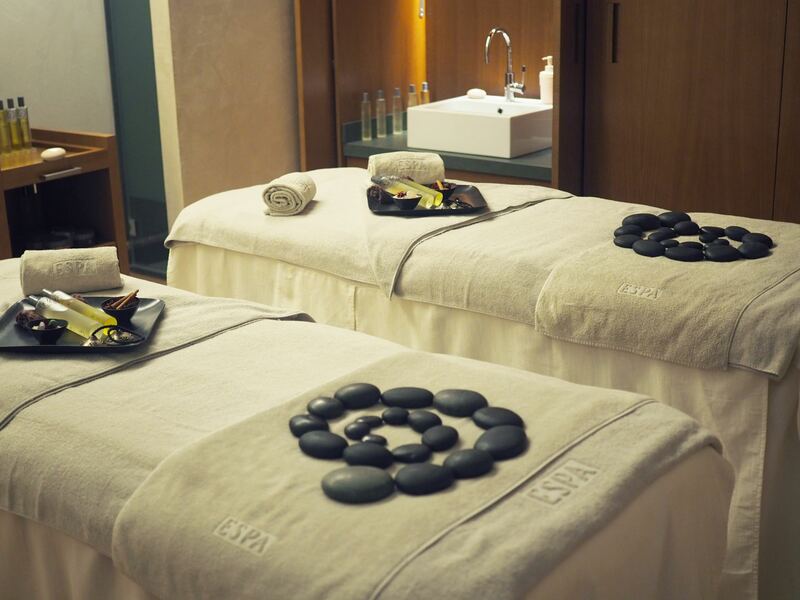 After a morning of being true Italians, we popped back to the hotel for a late afternoon spa treatment in their ESPA spa. 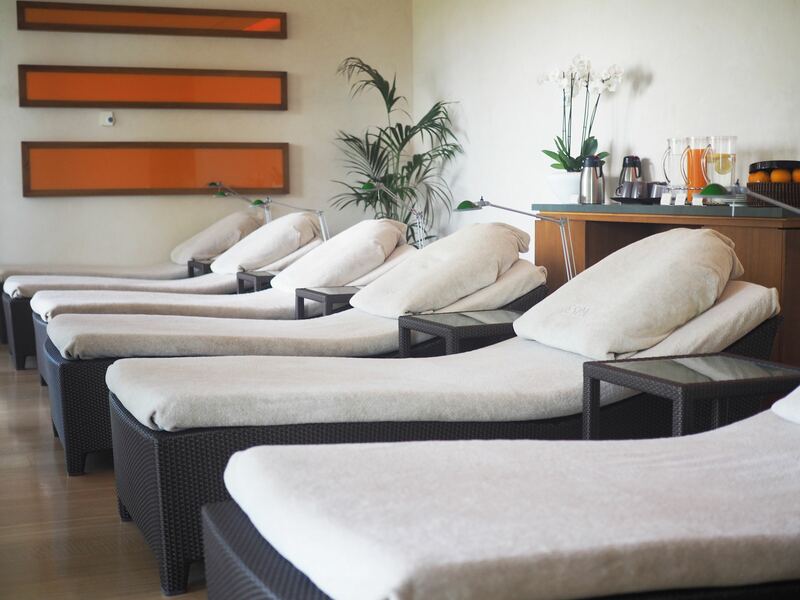 I’m no stranger to the ESPA brand having had a few treatments from their spas in different hotels. 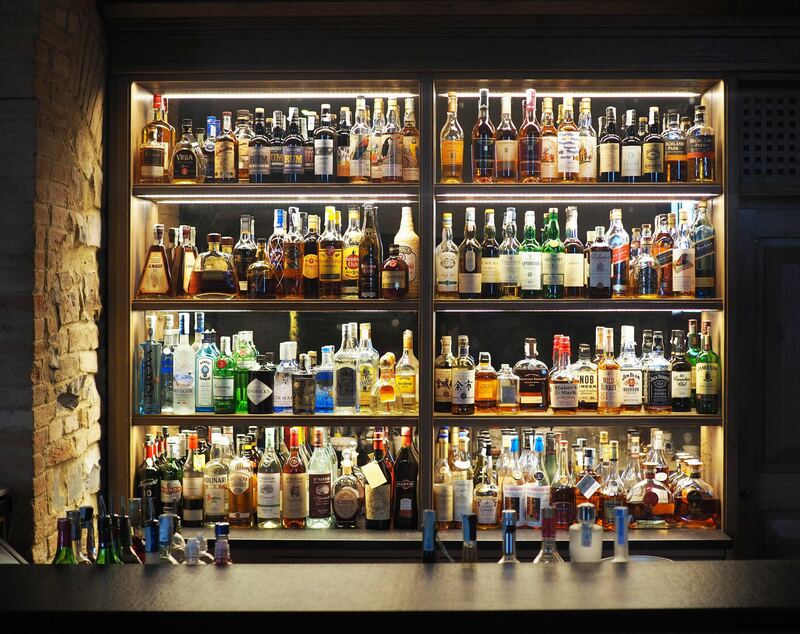 Remember, my last one was at Four Seasons in Lisbon? 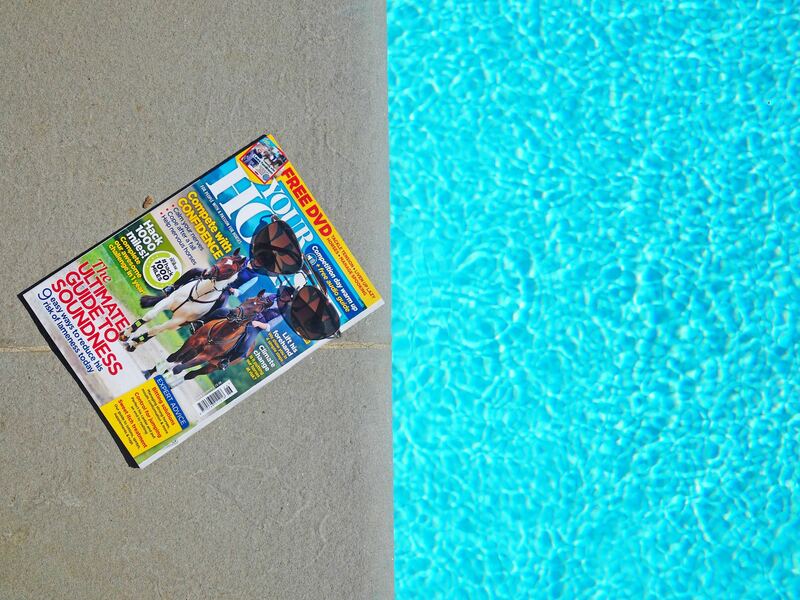 Since we had a lot of time to play around with, I went for a bit of pool time prior to my spa treatment. 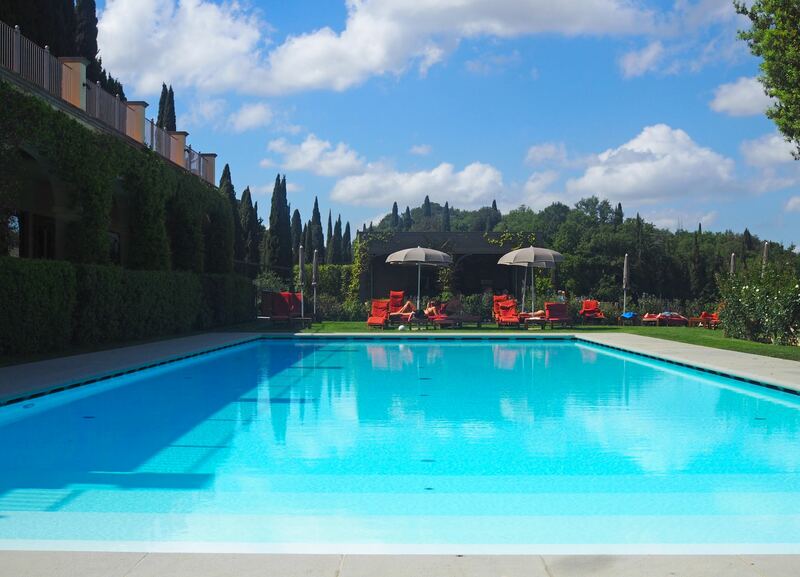 It’s not everyday you get to spend time by a gorgeous outdoor pool under the blazing hot sun, in the middle of Tuscany. They had a pore-opening steam room that really refreshes your skin. Also, a menthol based Turkish bath if you’re looking for something to help your breathing and fill your lungs with goodness. 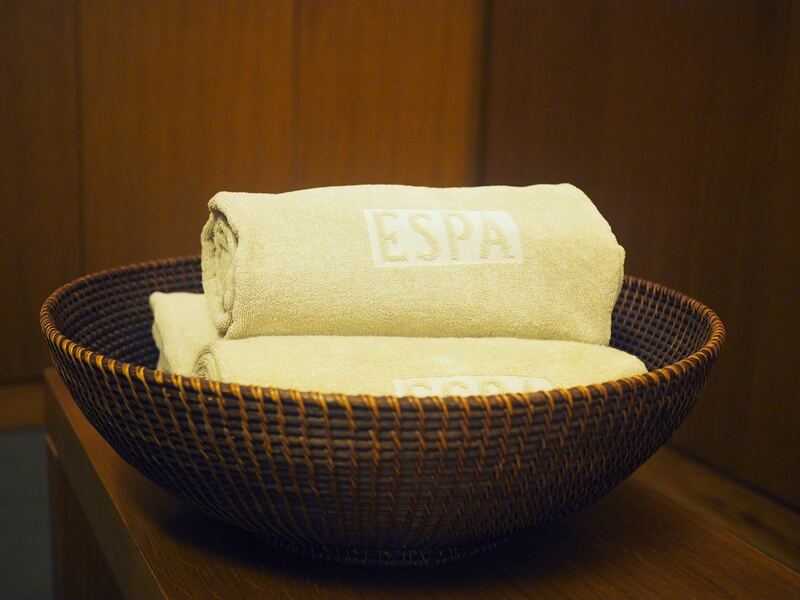 The changing rooms were all kitted out with ESPA products and everything you could possibly need. Including hair gels, wax and hairspray. Bravo Castello de Nero and ESPA! I spent the rest of my Saturday afternoon having full body massage by one of their talented therapists, loosening all my tense muscles and knots. I could think of worse ways to spend an hour or two. After what was the most needed massage, I popped off to get ready for our dinner at La Torre, but first we visited the bar for an aperitif. 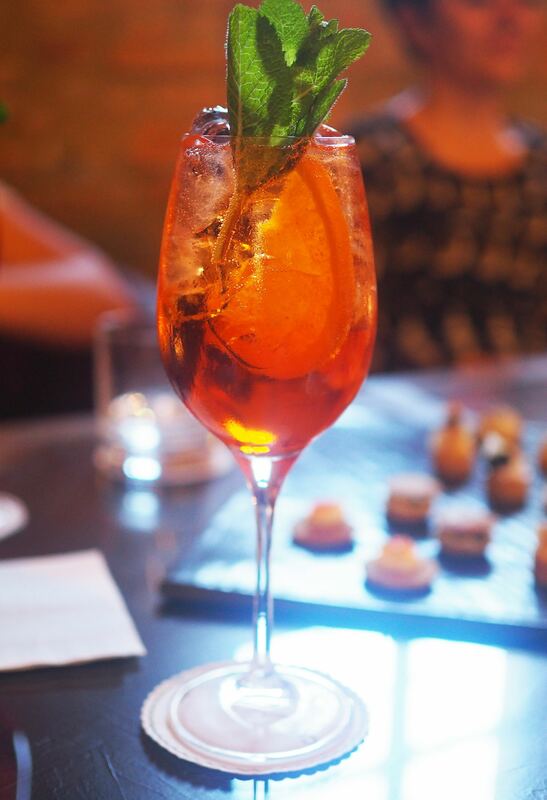 I felt like we were going to be in for a night filled with bubbles, so I didn’t have my usual champagne aperitif and went for something more refreshing, an Aperol Spritz. 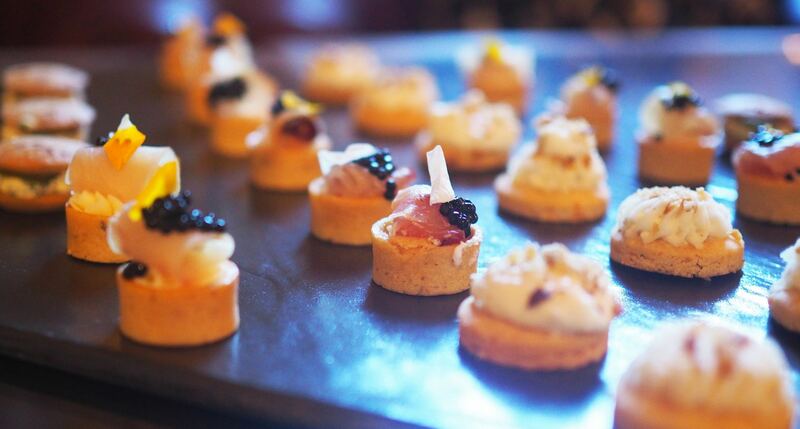 Chef had even sent out some lovely canapés for us to enjoy to get our taste buds going before his gourmet meal. The rest is just history?  Only joking, all will be revealed here. 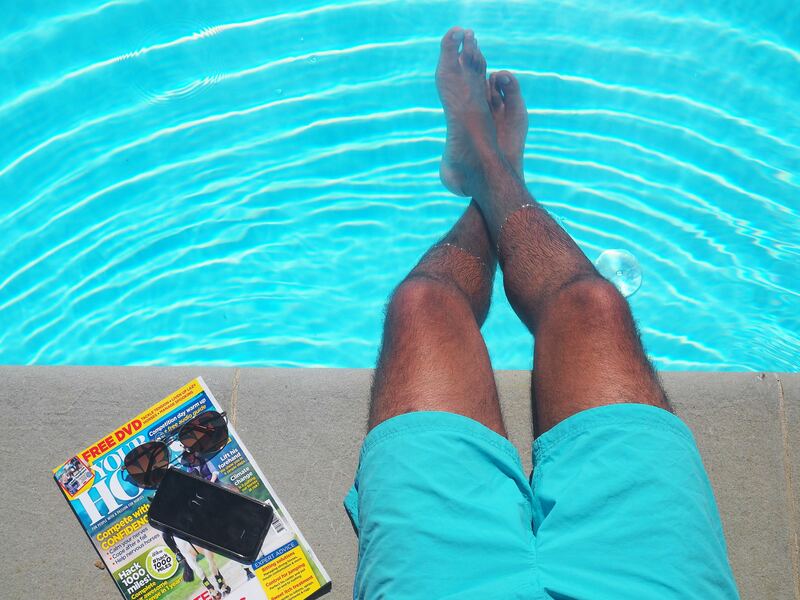 After quite a boozy evening, we spend Sunday morning having some more pool time before exploring the estate. 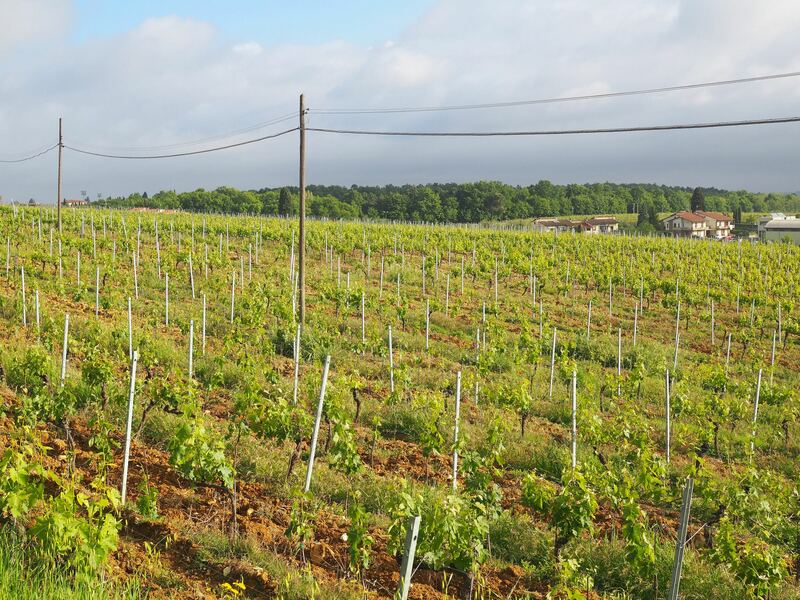 We came across the resident apartments they have to rent out, trails of growing grapes and some of the buildings that are in development. 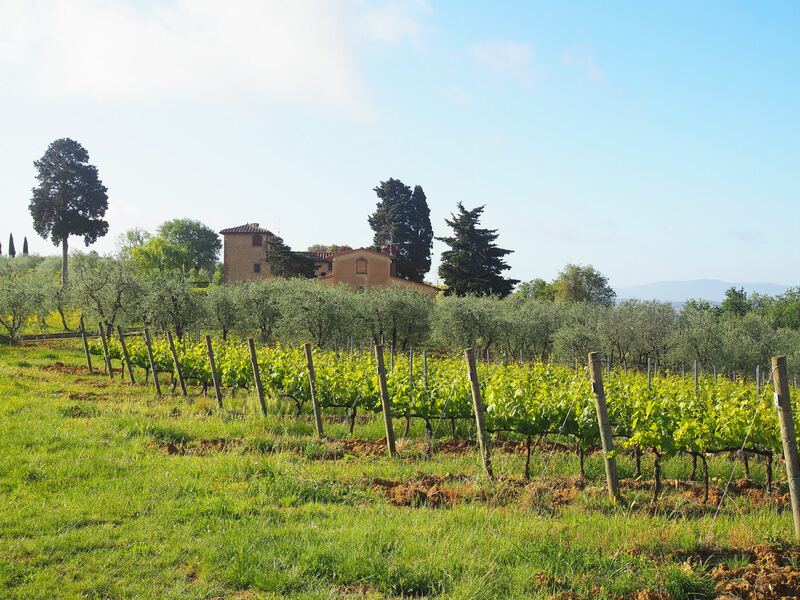 I can tell if I came back to Castello Del Nero in a few years time, it will have a whole new concept to it with all the land in use. 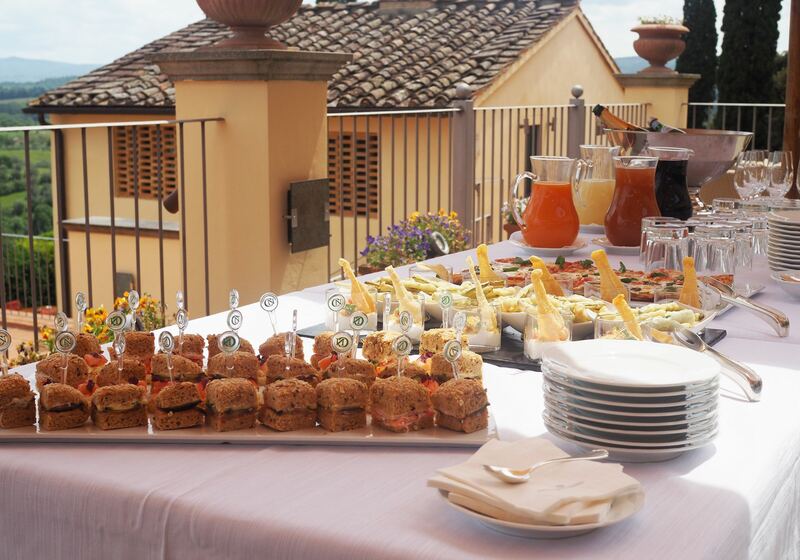 The team at Castello del Nero prepared one last lunch for us before we headed off to the airport. 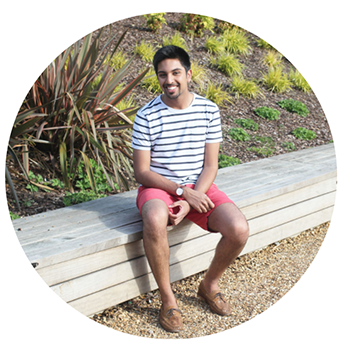 Although I was adamant I didn’t want to leave and there must be a spare marketing position for me to join the team. I don’t think my heart has ever been filled with so much sadness leaving a hotel before. 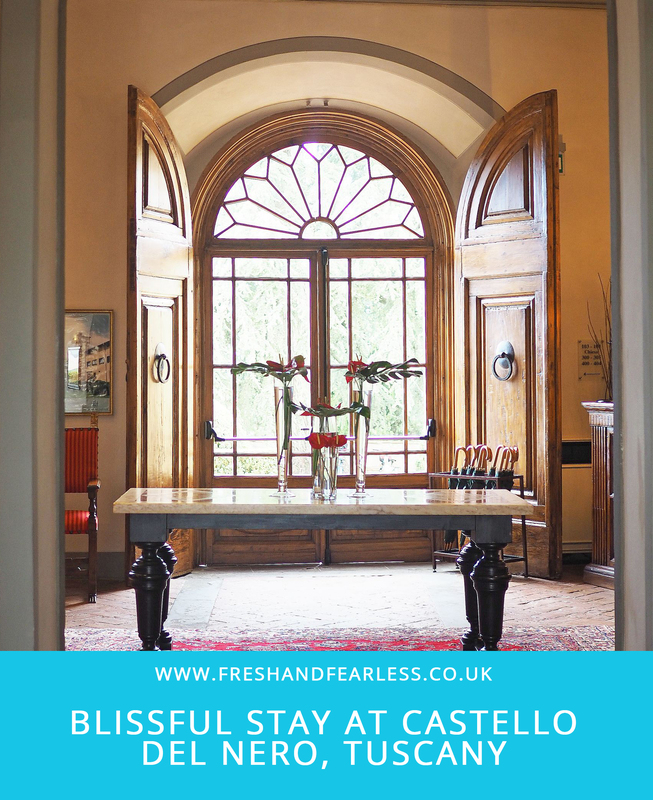 I just want to thank the entire team at Castello Del Nero, especially Elisa for giving us the royal treatment and truly letting us experience Tuscany in true luxury. I will be back soon, that’s a promise! 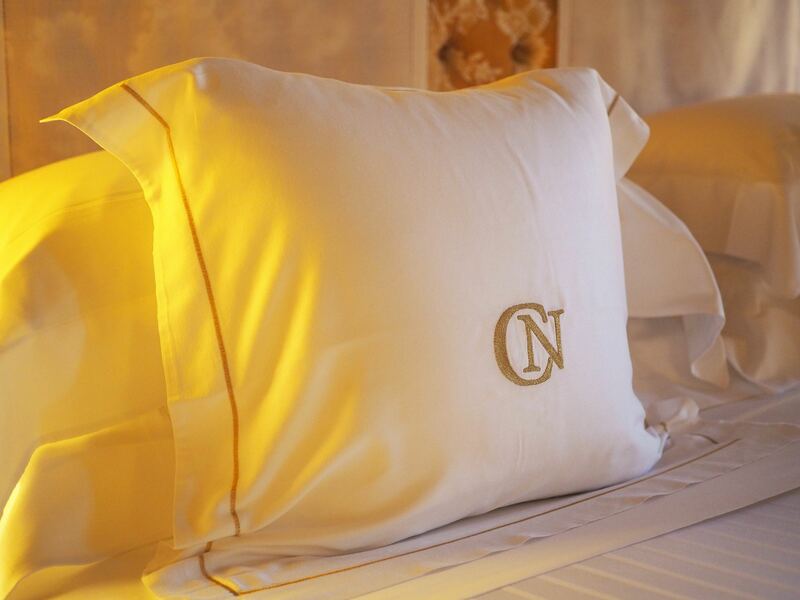 I was a guest at Castello del Nero and my experience was complimentary.